You know you are someone who commands attention and so get ready to be irresistible. Heads will turn and it will be nearly impossible for anyone to pass you by with this sultry, classic look. The Vintage Vixen wig will put a zing into your step that just accentuates your timeless beauty. This wig is fully of long layers of waves with side swept bangs on a right part that will have others admiring you all night long. If you feel like someone is watching you, it is probably because they can't take their eyes off of your hair! I bought this wig for work. I have short turquoise hair and that isn’t allowed at work. I work in a nursing home type setting and haven’t had any issues with this wig moving around or anything also I live in Florida and it’s no more hot than when I had long hair. I love this wig its so cute and looks adorable with a head band. It allows me to look professional and still be me when I’m off the clock. I'm 23 and have been losing LOTS of hair lately, due to stress. It's a big hit to the self-esteem, seeing as my hair was my favorite feature and always got compliments before it started falling out. I finally caved and decided to get a wig. This seems to be a pretty awesome product - looks natural (has a bit of shine at the top, but is dulling down with baby powder and regular use). I got color 24BT18, a bit darker than my natural color, but looks great - especially with the subtle highlights!! Overall I'm very happy. I feel confident enough to wear this out of the house, and that's saying something! This is the first wig that I bought when I began chemo. I was very attached to my hair and had horrible visions of what a wig would look like and feel like on me. I am so glad that THIS was my purchase! ALL my friends tell me how wonderful it looks and REAL. I wear it a little more off centered because I have a rounder face and it looks better. I bought this in 4 and I'll admit it was a little darker than I thought but it looks AMAZING! I paid a little over $40 (including shipping) and I wear it just about every day, and yes it tangles but only in the back underneath layer and they get bad, and it's beginning to look a little scraggily in the back underneath layer from it. This wig has restored the confidence that I had before I started chemo and for a 25 year old mother of 5 that's worth a LOT! k i posted way back in dec 2008 and i just want to say i still got the same one and it looks fab! ya gotta take care of it but it STILL looks amazing! going for another one with a different color cuz i love it so much! best wig on this site!!! I just got mine today in the mail. At first when I pulled it out, I thought the texture was amazing; it felt better than my real hair! I have PCOS and it affects the thickness of my hair and at 21 years old it messes with my self confidence, greatly. So this is the first wig I've bought after going back and forth on what to get and I can honestly say it looks amazing on. Has enough wave in it that it looks like I just got some extensions in my hair to people who see me on a regular basis. Love the adjustable band inside. I just ran my fingers thru it, and nothing more. I prefer the longer bangs, I just sweep it to the side and get a real cute, vintage look. (hence the name) Love the color (I got it in 1B) it's a soft black (which is the color I've always kept my hair) and I plan to use this on a daily basis. I can't say enough nice things about it! Just got this wig yesterday, and it is FANTASTIC. I used to have longish hair, but then I cut it all off before remembering how thin my hair is. Consequently, I get to missing my long hair sometimes. This is absolutely a gorgeous wig, and it does look real, although it is a bit shiny right out of the package. I plan to wash it in the next couple of days and see if that kicks the shine down some. The only other complaint I have (if you can even call it that) is that it's a little fuller on the sides than I would like (like I said, I have pretty thin hair, so I'm not used to it sticking out that much), but that's easily remedied with a few bobby pins. I pinned the front sides of it back and it looked nice and romantic and girly and I loved it. I highly recommend this wig to everyone. It is a great investment and an all-around beautiful piece. Hello Ladies, I am so pleased to hear the great results of this wig. I wanted to suggest a couple of things so you can help keep your wigs looking great for a long time. If your wig has a lot of shine you would like to get rid of, all you have to do is sprinkle powder on it, shake it out and repeat if needed. Baby powder, a body powder, needs to be something in a white fine powder, shake the wig and then gently comb it with a wide tooth comb, Plus it adds a nice fresh scent. All the washing and brushing will wear your wig out faster. Also, about the tangles in the back, before putting it on lay it across your lap using a wide tooth comb and starting from the bottom gently work your way up to the cap. I keep three wide tooth combs around even for straight wigs and during the day if it needs combing, always starting at the bottom work my way up to the cap and it's all smooth again. If you are trying to comb from the top to the bottom it will tangle badly. I wear wigs all the time, not out of necessity but for fun, I have a friend who owns a wig shop and she has given me a lot of tips on how to take care of and style a wig. 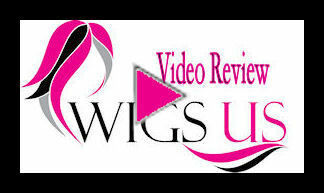 I have purchased 4 wigs already from Wigs-US, I love them. They have great items and fast shipping AND great pricing. Please feel free to copy and use these tips if you wish. Have fun and good luck to you all. HI. I was wondering if any of you ladies would like to share a picture of you wearing the wig? I have bought 2 wigs from other sites but always got the wrong color. I am really loving this wig. I'm afraid to buy it since I might get a wrong color....my other wigs have always been too dark even though I ordered a dark brown. Anyway, would be great to see pics of someone wearing this wig!!! THANKS! Like the first post of Aidra, I am also on the fence. I am having trouble styling the bangs... how Can I make them look believeable... Because the style is set already, I feel that there is nothing I can do--the color is beautiful but its the front that I am having a hard time with-- HELP@! I just got mine today. Very fast shipping! This is a BEAUTIFUL wig! I got #4 which is a dark brown. Unlike the others, this color is not too dark (for me anyway) and looks amazing! Very soft and love the style. For the bangs, I just brush them to the side and hold them in place with a bobby pin. Looks cute. I also wear a head band alot so looks cute that way too. I'm thinking about buying another one of these just so I have a spare! Custumer service is exellent too. They heped me figure out the color as I was having trouble deciding. I will order more! Great website! one of my least favorite wigs. waaaaay thinner than i ever expected, the bangs hang flat and look so unnatural. hate it. Just ordered this wig again. I have 4 of this one. :) Love it. I got it in 2 days! Very fast shipping! Customer Service is awesome. They helped me before until I was happy. Great company, very friendly. Will order more! Thanks!